KeryFlex is a safe, nonsystemic in-office application that restores the appearance of patient’s natural nails. The product allows the podiatrist to remodel patients’ nails affected by fungus, nail dystrophies and trauma. The patented resin creates a flexible, non-porous nail that allows the remaining natural nails to grow. 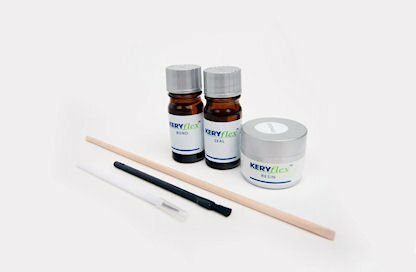 The KeryFlex nail provides a natural looking nail during oral anti-fungal therapies, immediate cosmetic improvement to compliment laser fungal treatments, or can be used as a stand alone solution. The KeryFlex nail is durable and unaffected by acetone, nail polishes or detergents, and does not contain acids like acrylic which can bind to and damage the nail bed.